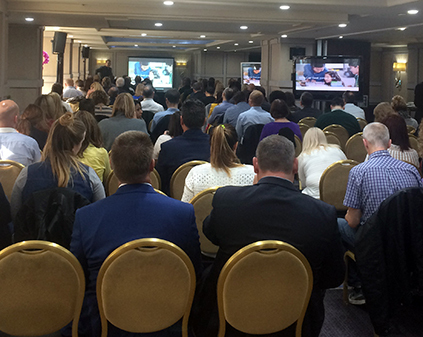 The Baby Products Association’s Child Car Restraint Conference – which took place in central London this week – attracted over 130 delegates from across Europe addressing wide spread confusion about new regulatory framework for booster seats. Expert speakers included Marianne Hynd of Graco, Mark Pitcher of TRL, Costandinos Visvikis of Cybex, Erik Salters of Dorel and Richard Frank of Britax; and all explained the complexities of the current R44 Regulation compared to the new UN Regulation R129 which now runs parallel. Representatives from many major retailers such as Mothercare, Kiddicare, John Lewis and Halfords as well as independent retailers and consumer parenting press turned out in force and took the opportunity to raise pertinent questions that are currently confusing the industry. One myth is that backless booster seats will become illegal from next year. Marianne clarified that this is not the case. Backless booster seats which meet current regulations will remain legal, so they can continue to be sold and used and parents who have already purchased these products may continue to use them with confidence. However, the new amendment to the regulation means that a new booster cushion can only be type-approved for children weighing between 22 and 36 kg and will restrict its use to children of 125 cm in height and above. It was also clarified that whilst ISOfix car restraints are preferable, mainly because the window for error when fitting is much lower, belted restraints will remain legal for use as long as they meet either ECE Regulation 44 or 129. Retailers attending the event highlighted the need for much greater industry guidance from both manufacturers and suppliers of child car restraints and the automotive industry. Those offering a child restraint fitting service explained the difficulties they face when customers’ vehicles are not on specific product lists and there is no direct guidance as to which product is most suitable for children travelling in those vehicles. Luke Burns, chairman of the Baby Products Association, took all of these comments on board and has promised to highlight key points raised at the next association’s executive committee meeting for future work. The issue was also raised that there is an apparent unawareness by the general public that all children up to 135cm in height must, by law, use some method of child restraint or booster cushion. It is common for children as young as six or seven to be seen travelling in vehicles with nothing more than an adult seat belt. The Baby Products Association will also look to include this issue in its next consumer Child Safety Campaign. A useful leaflet ‘Choosing the Right Car Seat’ can be downloaded HERE.